Windows Flip 3D is a new feature in Windows Vista that dynamically render live comprehensive thumbnail images of the exact contents of all open windows, making it easier for users to identify the window in a graceful three-dimensional view of visual depth. 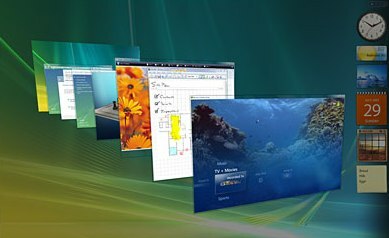 Windows Vista Flip3D view is triggered and initiated by using Start (Windows) + Tab keys, unlike the usual Alt + Tab task switcher, which still exists in Windows Vista. As most people is used to using “Alt + Tab” to jump between window, which does its job of switching window perfectly and quickly, the Windows Flip3D Switcher may be useless for some. If you decide and swear that you won’t be using Windows Flip3D or Windows Switcher anymore in future, it’s possible to disable and turn off Windows Flip3D feature in Vista to avoid accidentally launch the Flip 3D switching view. If you can’t see “DWM” registry key, create a new key and name it as DWM. Inside DWM registry branch, create a new value (in the right pane) of DWORD (32-bit) Value by right click on any blank space, and then select New. Assign DisallowFlip3d as the value name, and then set the value data as 1 (0x00000001). Alternatively, download DisableFlip3D.reg file (no longer available), and then double-click on the file to merge the registry key and value into system registry. For users using Windows Vista Ultimate, Business or Enterprise edition, it’s possible to set the registry key to disable Flip 3D by using policy. To do this, click Start button, and then type gpedit.msc into Start Search box, then press Enter to run Local Group Policy Editor. In the “Local Group Policy Editor”, expand Computer Configuration, expand Administrative Templates, and then expand Windows Components. Select Desktop Window Manager and enable Do not allow flip3d invocation. After modifying the registry or set the policy, restart Desktop Window Manager Session Manager service by using Services module in Administrator Tools of Control Panel. Alternatively, open Command Prompt as Administrator, then run the following commands one by one following by Enter to restart Desktop Window Manager Session Manager service. Users can also just reboot the computer. If you have a change of heart and now want to make use of Windows Flip 3D or Windows Switcher feature again, simply delete away the DisallowFlip3d registry value. You may also delete the DWM registry key if it’s no longer in use. Alternatively download the EnableFlip3D.reg (no longer available), and then double-click on the file to merge the registry key and value into system registry. If you disallow Flip3D using Local Group Policy Editor, go back to the policy and set the Do not allow flip3d invocation parameter to Not Configured or Disabled. Restart Desktop Window Manager Session Manager service using instruction above or just reboot the PC.